With this Tristan added to its recent Parsifal, and with its multi-director Ring cycle launching this summer and due for completion in October 2017, the southwest German city of Karlsruhe seems set to become something of a Badischer Bayreuth. As the brochure calling for donations towards its new Ring claims, ‘Karlsruhe ist eine Wagner-Stadt’. It certainly has some of the necessary credentials: Wagner himself visited seven times, Hermann Levi and Felix Mottl conducted early performances of his works there, Joseph Keilberth cut his professional teeth at what was his home-town theatre, and in more recent times the company has helped launch the Wagnerian careers of Deborah Polaski, Lance Ryan and Stuart Skelton. Now, too, it is attracting some of the bigger names in operatic production, and this Tristan was put in the capable hands of Christopher Alden, a director known for his ability to draw out unexplored facets of an opera’s essence. With Tristan und Isolde, Alden isn’t interested in a specific milieu or even a strictly narrative telling of the story. Costumes are mid-20th-century and the single setting for all three acts is perhaps a lounge on a luxury cruise liner in 1920s modernist style – a light, bright environment for characters who constantly seek night and darkness. In a programme interview, Alden says he sees Wagner’s concept of love here as of an insoluble togetherness, and not simply a romantic attraction. He plays off this existential relationship between Tristan and Isolde with a more traditional, down-to-earth love-play between Brangäne and Kurwenal: during the Act II tryst they hover in the background, each in their own tormented world, until Brangäne plucks up the courage and makes a pass at her opposite number but is spurned; then, during the climax of the duet, as her warning flames almost seem to set the whole place ablaze, he finally attempts to return the favour but backs off. Meanwhile, Tristan and Isolde’s attachment is at different times physically distant (they greet each other at the start of Act II from opposite sides of the stage) and intimate – they spend Brangäne’s first warning dancing a slow, smoochy waltz in each other’s arms. 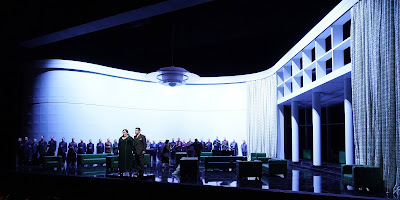 Their physical engagement is therefore not nearly as cool as in Christoph Marthaler’s Bayreuth production (there are visual parallels, though, with the liner setting, the light manipulated by switches on the wall and the secondary characters often emoting in silence in the background), but their apartness is shown to be a crucial element of their interaction. For instance, they seem to spend a lot of time standing staring at each other without touching – as preceding the strikingly delayed consumption of the potion in Act I. Isolde is present on stage for much of the last act, in Tristan’s environment, in his mind, but each is unaware of the other’s physical nearness. Theirs is a world where being apart is to be alive and in agony, together is oblivion and ecstasy. Tristan’s wound, supposedly healed by Isolde’s magic powers, is an open one that like Amfortas’ refuses to heal, and in keeping it fresh he becomes the agent of his own demise. Brangäne had concocted the love potion from the lounge’s cocktail bar, following one of Isolde’s mother’s recipe cards, and in Act III Tristan hopes in desperation that by mixing his own drink from the same pool of ingredients he will find the poison that they had both expected and longed for. His death-wish is viscerally exposed throughout the evening, while Isolde’s ultimate fate is left open – she sings the Liebestod far from Tristan’s body and poised with a pistol in hand but unraised as the lights cut. Alden also points up the formal similarities between all three acts. 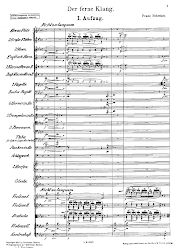 Each opens, after an orchestral prelude in each case, with an offstage contribution that defines the real world: the young sailor in Act I, the hunting horns in Act II and the shepherd’s ‘alte Weise’ in Act III. All three are visually suggested to be coming from a wind-up gramophone, hinting at an artificial intrusion into the imaginary, internal world that takes over for the rest of each act. Each also ends, like a stuck record on that gramophone, with the arrival of King Mark and his men, here a brutal lot who are happy to duff Brangäne and Kurwenal up in Act II and who, with Melot standing aloof above them on a balcony, maintain a menacing presence whenever they are on stage. Thus in each case, the ‘real world’, the world of ‘light’ and ‘day’, prevails. With these arching parallels and his fascinating, often provocative Personenregie, Alden’s conceptual exploration of many of the opera’s themes is thus impressive, and everything works consistently within the world he has chosen to present. With no fewer than three Tristan productions staged within this quarter of southwest Germany inside of a month (the others were at Baden-Baden and at the regional theatre in Kaiserslautern) the call upon singers for the main roles has naturally been competitive. Karlsruhe hit lucky with two Americans, Erin Caves and Heidi Melton. Caves, who had previously sung Tristan in Stuttgart, doesn’t have a big voice, and at times struggled to equal the vocal power of his Isolde, but he gained in sonic penetration as the evening progressed and, apart from some unfortunate but forgiveable evidence of tiring in the latter stages, sang with both mellifluous and incisive command, and he threw his all into a highly physical presentation of the role. Melton, a former member of the Karlsruhe ensemble and who was due in London shortly after this performance to begin rehearsing the part of Isolde in English for ENO, was magnificent: a full, rich soprano with carrying power to match her lyrical and word-sensitive delivery. With the subsidiary roles double-cast during this six-performance run, this was the debut night for the ‘B’ team, who acquitted themselves generally positively. I had some caveats about the Brangäne of Christine Niessen, whose voice exhibited a rather large tonal divide between a somewhat shrill upper range and sumptuous lower one. Armin Kolarczyk, though, was a determined but sympathetic Kurwenal and his warm, subtle singing gave evidence of why he has been snapped up by Bayreuth for its new Meistersinger next year. Konstantin Gorny’s Mark conveyed the bitterness in the character’s sense of betrayal and Matthias Wojlbrecht’s Melot made his mark without resorting to clichéd villainy. Cameron Becker’s Young Sailor and Shepherd (and manipulator of the wind-up gramophone in Act III) was lyrical and sensitive, and Mehmet Altiparmak made a telling cameo as the Steersman. I can’t claim to have registered any differences, having read of the fact after the event, but the musical preparation for this production had had recourse to a copy of the score in the Staatstheater archives that bears annotations by Felix Mottl from the time of the Karlsruhe premiere of Tristan in 1884 – instructions conveying first-hand evidence of the Master’s wishes that seem to go beyond the stage-direction additions already present in the Peters Edition/Dover score and chiefly cover dynamic variations. Justin Brown certainly drew nuanced playing from the Staatstheater orchestra which, despite one or two smudged entries and links, had both suavity and fire, characteristics that also marked Brown’s interpretative decisions.